The Denpasar District Court charged an Australian man on Wednesday with smuggling drugs into Bali in his stomach. 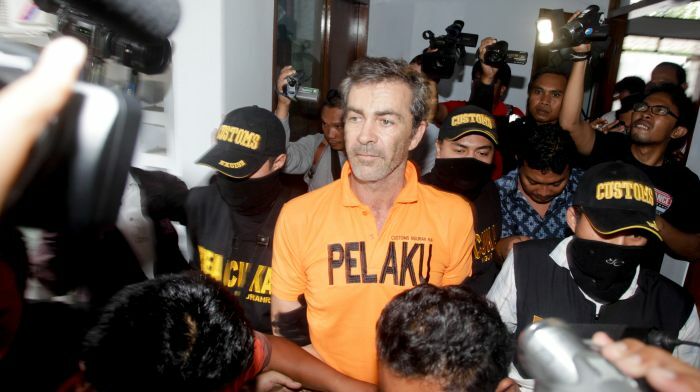 Edward Myatt, 54, was arrested in late February at the Ngurah Rai International Airport and was charged with “producing and smuggling drugs,” prosecutor Gusti Putu Atmaja told the court. Myatt had flown from London to New Delhi to pick up hashish and methamphetamines before transiting in Bangkok and then flying to Bali, Atmaja said. “He swallowed 70 capsules of hashish weighing 1,103 grammes, and a capsule of methamphetamine weighing seven grammes”, he said. Myatt appeared calm in court but did not speak to reporters. While the charge carries the death sentence, Indonesia rarely enforces capital punishment for smuggling small amounts of drugs, handing down lengthy jail terms instead. Two Australians are on death row in Kerobokan Prison for smuggling large amounts of heroin strapped to their bodies, while several others are serving long jail terms for drug crimes. I think the plan is to fill Kerobikan with Australians so they can take it over and free Schapelle! I fully agree with JRB. There is so much publicity about Australians and foreigners locked up in Bali when will they learn. There is a sign at Denpasar Airport it says ‘Death to those who bring drugs to Bali’. I have no empathy for those caught.